Guests will awake to the soothing sound of waves each morning. This suite is a stone's throw away from the beach and has a magnificent view that dominates the beach and sea. The lavish interiors bring together sophisticated dark browns, sleek wood furniture and a delicate mix of metallic lines and curves creating a modern yet classical theme. The bedroom features a sumptuous en-suite bathroom, complete with a romantic round bathtub and outdoor shower area set among exotic plants and shrubs. A spacious living area opens out onto the terrace, both featuring plush furniture and accessories symbolising comfort, practicality and luxury. 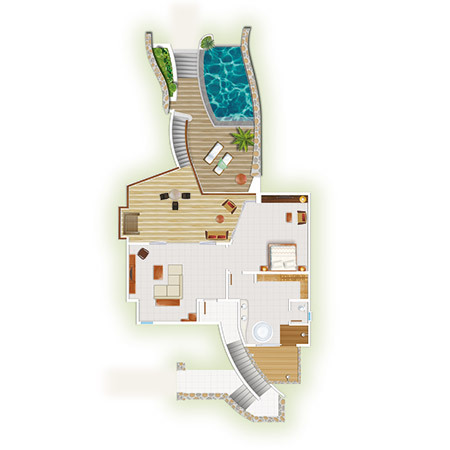 A private staircase leads guests to their own pool surrounded by a smooth wooden decking. Surrounded by a traditional dry rock wall, this suite provides perfect privacy indoors and outdoors. The Beach Front Senior Suite with pool symbolises the epitome of luxury.